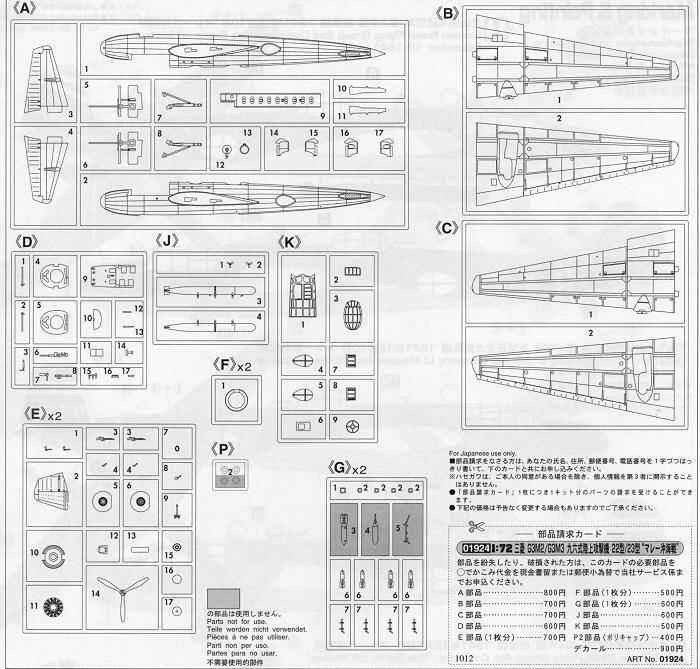 Hasegawa 1/72 G3M3 Type 96 (Nell) "Kanoya Flying Group"
Those who have been around a while will know that this is not the first 1/72 kit of this aircraft with LS producing a version way back in the heydays of modeling during the early 1970s. While not a bad kit, it is crude by comparison. Even this kit is not ultra new as Hasegawa has been producing this one sporadically for at least the last ten years. During their 'let us do a bunch of Japanese twins' period, the Nell was one of those that was produced. 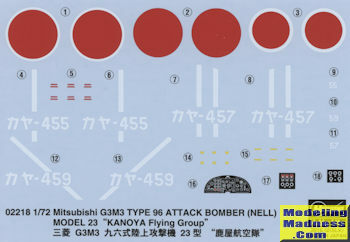 One has to decide which markings scheme is to be done about a third of the way through the build and there are notes showing which bits are appropriate for which markings option. The kit can be built with or without prop spinners, with the lower entrance hatch open or closed, with the upper cockpit hatch open or closed and with either a bomb or torpedo load. Apparently Nell did not have a standard bomb bay with doors so all loads are external of sorts. Markings are provided for three similarly painted aircraft, all in dark green over light grey. This was a typical scheme for late war aircraft and all three options are from 1944. They differ only in the tail markings. All are from the Kanoya Naval Flying Group. 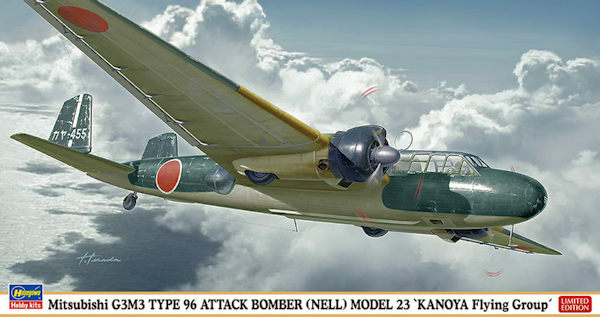 For the history buff, Kanoya is located on the southern section of the south island of Kyushu and from here, a majority of the kamikaze flights took off for the battles over Okinawa. The decals are very nicely printed and should work just great. Thanks to the yen/dollar rate, this is a relatively inexpensive kit as things go. If you have never thought of ordering from overseas, you should give it a try. I think you'll find it a positive experience and it will allow you to get some great kits, such as this one, for a very reasonable price. Thanks to www.hlj.com for the preview kit. You can get yours at this link.